Taking over the kitchen at The Duke's Head in Highgate this August is Claw - who, as the name suggests, specialise in crab, and crab meat. Expect things like burgers (inc Kimchi and Avacado versions), plus ,ac & cheese, and vegetarian options. "On discovering that the UK is exporting almost 80% of our crab to the rest of Europe, we decided that it was about time to bring the humble crab back to British plates. 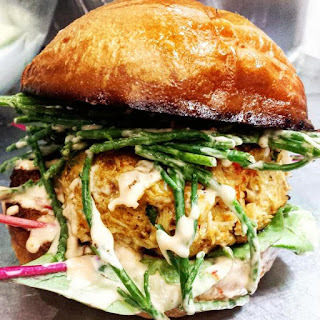 After lots of debating, we packed in our jobs and set out on our mission to reignite Britain's love affair with crab – and perhaps discover a few other locally-sourced delicacies along the way. Since starting, we have had the same ambition: to cook food that is quality-focused, simple and seasonal - we hope you enjoy it!"